One a penny, two a penny... Yes, it's that time of year. 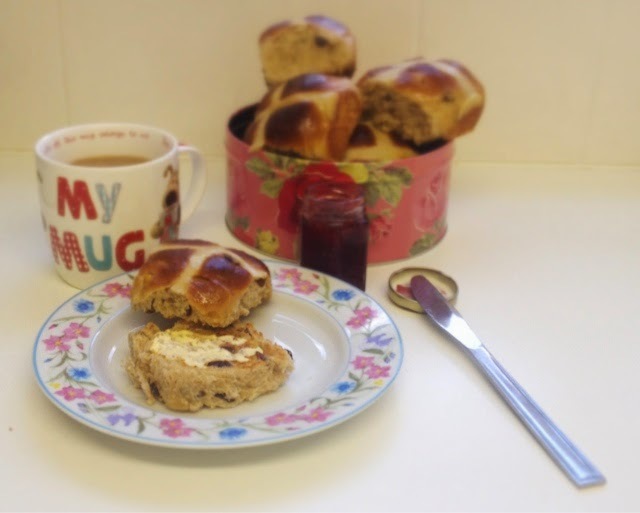 Easter is just around the corner and I will be visiting family at the weekend so I thought homemade Hot Cross Buns would go down a treat! I have never made them before so I have used a recipe from bakinginspiration.com but I will be making some recommendations and small changes to their recipe. Start by measuring out all your ingredients. 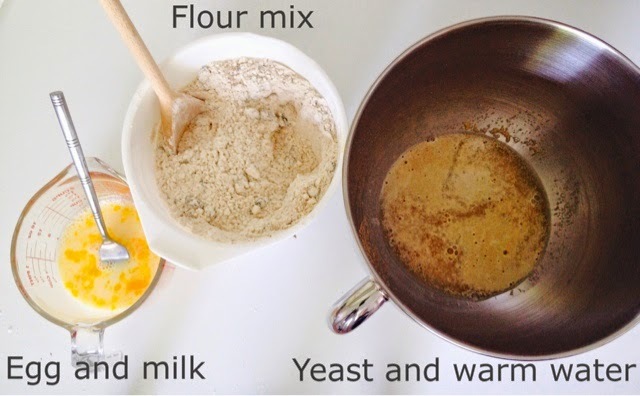 When making any dough I always add the warm water to the yeast in my kMix bowl. 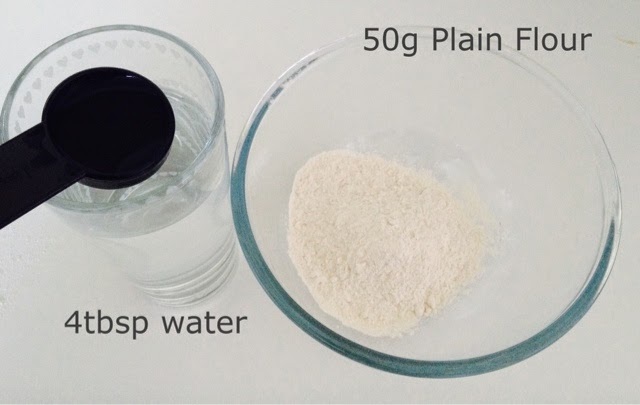 I know it isn't necessary to do this as there is no need to activate fast action yeast in water first but it is just habit. Now crack your egg into a jug and add enough milk to make 150ml (approx 60ml). The recipe asked for 450g of Strong White Flour but I would definitely recommend 500g as the dough was just too wet and sticky to handle. Add the salt to you 500g of Strong White Flour and rub in the butter. 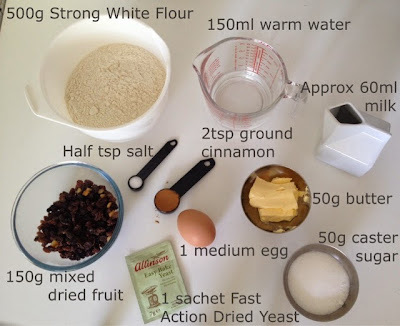 Add the sugar, cinnamon and dried fruit to the flour mix. The recipe listed sultanas and currants but I just bought a bag of mixed dried fruit which included sultanas, currants, raisins and candied mixed citrus peel. Add the flour and egg mix to the yeast. Take you bowl over to your electric mixer and attach the dough hook. My kMix has definitely been one of the best investments I have ever made and cheaper than a KitchenAid - I would definitely recommend buying one. Knead for 5 minutes until smooth, the dough should spring back when poked. Mmm that smell of cinnamon should really be coming through. If you don't have an electric mixer then knead on a lightly floured surface by hand for 10 minutes. Remove the hopefully not too wet and sticky dough from the bowl and weigh it, mine was 960g. 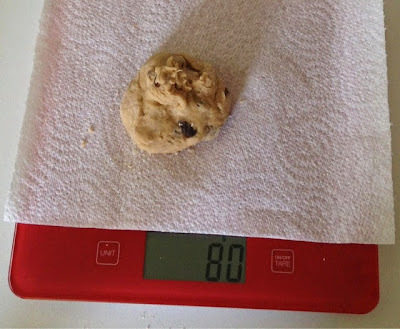 Transfer the dough to a lightly floured surface, divide and roll the dough into 12 pieces. To ensure the buns are all the same size and cook evenly it is good to weigh the individual buns. 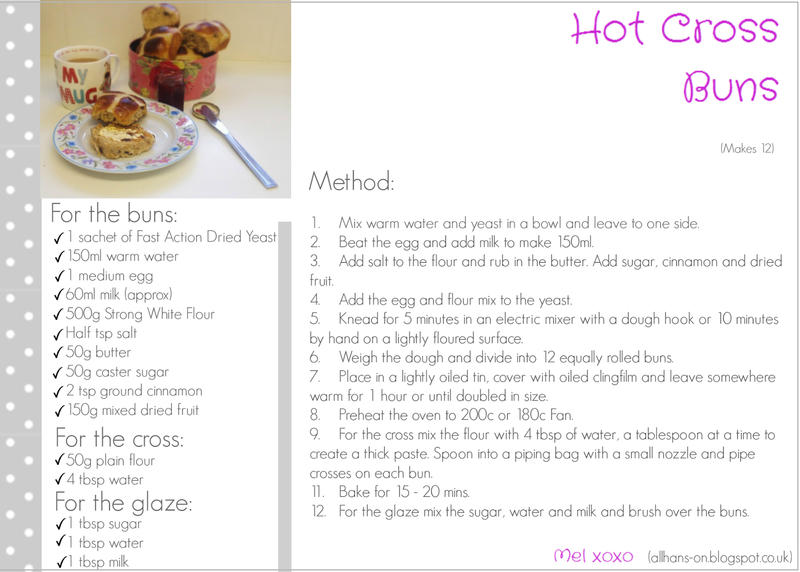 As this recipe makes 12 we need to divide the total weight (960) by 12, so each bun should weigh about 80g. 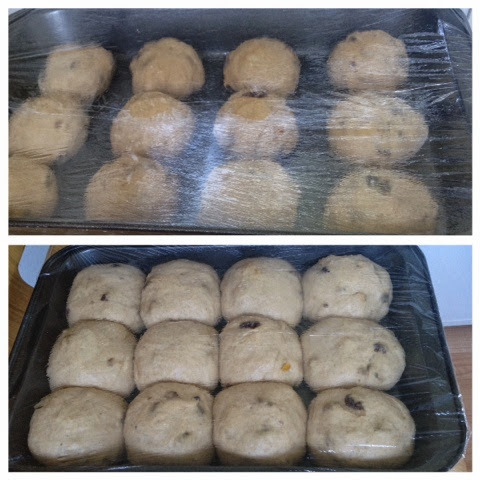 Once you have 12 equally sized buns place them in a lightly oiled tin, space them out to ensure there is enough room for the dough to expand when proving. Cover with oiled cling film and leave somewhere warm for about an hour or until doubled in size. After about 45 minutes I like to put the oven on to preheat and place the tray on a chair to aid in the proving process. For the cross, mix the flour with 4 tbsp of water, adding a tablespoon at a time to create a thick paste. I did 5 tbsp of water but I think it was a bit runny so 4 should be fine. Then spoon the paste into a piping bag with a small nozzle or just cut the tip of a disposable piping bag. 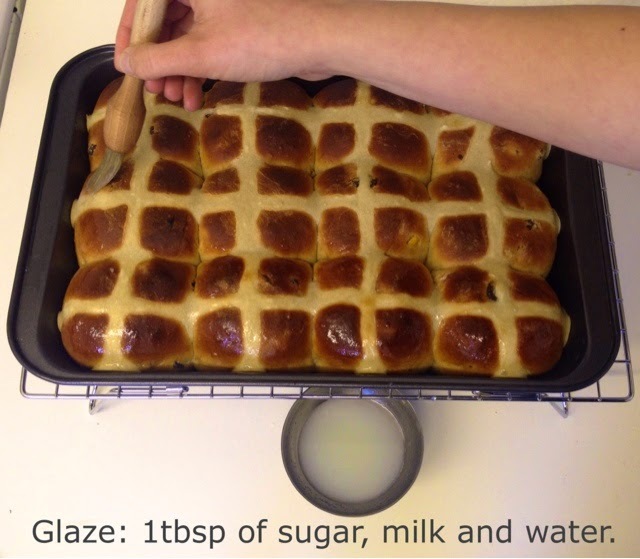 Pipe a line vertically and horizontally across each row of buns to create crosses, take your time to ensure the paste hugs the buns. Now bake for 15 - 20 mins. To make the glaze mix 1 tbsp sugar, 1 tbsp water and 1 tbsp of milk and brush over the warm buns, apricot jam is also a popular glaze if you would prefer. The glaze gives them a really great shine and stickyness!! These are my favourite when toasted with some homemade raspberry jam!! I am very pleased with my first attempt, I will definitely be making these again with the slight modifications I have mentioned! 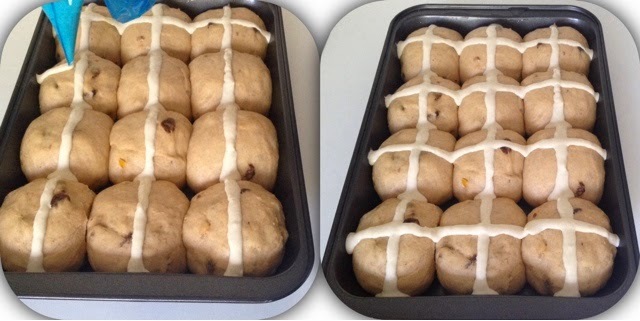 What will you be making this Easter?